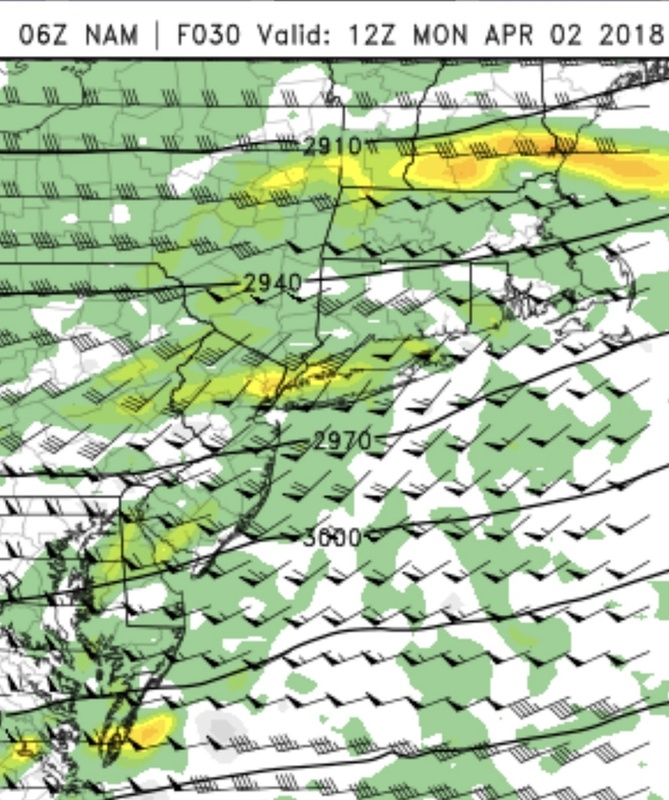 I only look at the 700 mb for frontogenesis and forcing. That is where all the action is for precipitation development and intensity. The 0Z ECMWF is not only steadfast with the snowy solution for the region, it now has it going below freezing in NYC. Not only that, it comes in before daybreak so that would allow for snow to accumulate. The last measurable snowfall at CPK in NYC was April 5th, 2006. I remember it wasn't freezing and during the day, but it was coming down at a high rate when it did. I was a sophomore in high school just finishing up lunch when I looked out the window and was amazed at the snow intensity. It was brief, but it gave CPK 0.1", which doesn't seem like much, but it put CPK's 2005-06 seasonal snow total from 39.9" to 40", making the fourth straight snow season to reach that level. Three years prior, April 7th, 2003, I was in school at the time and around 11 or so it started to come down at an intense rate, so it didnt take long to accumulate. Three years prior to that, April 9th, 2000, it was a Sunday and I was up mid-morning and I look out the window at first and it's rain but not long after that, it changed over to snow and began to accumulate. I was nine then and much of the winter I hadn't had much opportunity to play in the snow (I was sick on January 25th, 2000). Since I was not sick, I took full advantage and played in the snow in the backyard. Of course, it didn't take long for it to warm up after the snow and it was gone within a day. 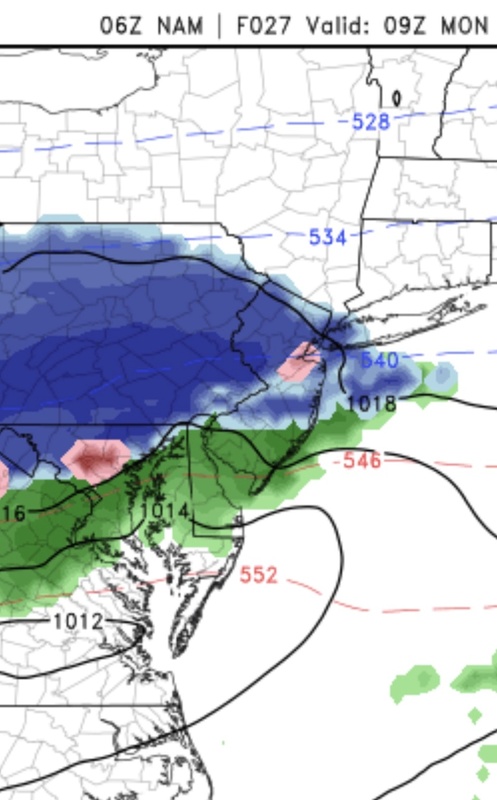 Speaking of which, model guidance has the sun coming out after the snow on Monday morning with temperatures in the 40s so it will not take long for the snow to melt. But as Scott mentioned, any snow in April is a bonus so I'll take it. I would probably head over to either Central Park or Bryant Park to record the footage. I don't know why but I'm feeling a little giddy about this, even if it's not a 6" snowstorm. * WHAT...SNOW EXPECTED. 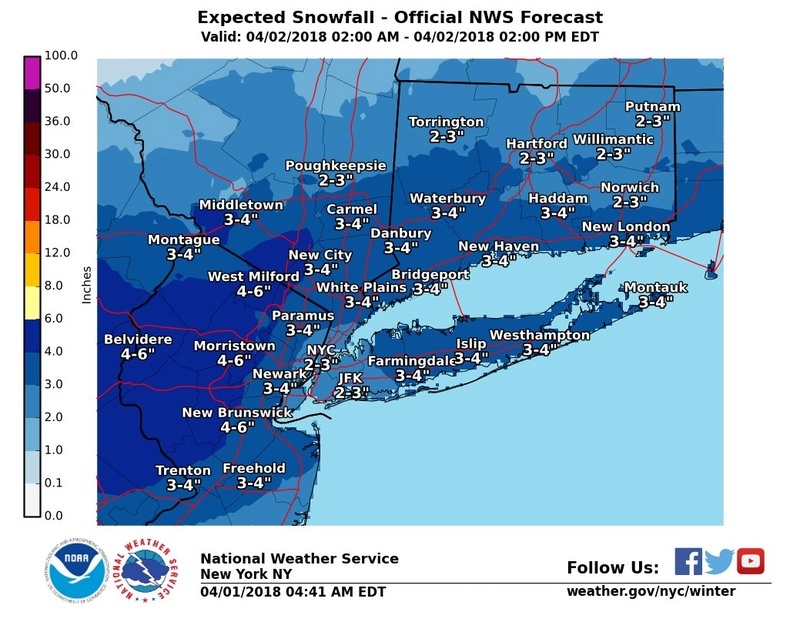 TOTAL SNOW ACCUMULATIONS OF 3 TO 5 INCHES ARE EXPECTED. UP TO 6 INCHES POSSIBLE IN A FEW SPOTS. * WHERE...PORTIONS OF CENTRAL, NORTHERN AND NORTHWEST NEW JERSEY AND EAST CENTRAL, NORTHEAST AND SOUTHEAST PENNSYLVANIA. * WHEN...FROM MIDNIGHT TONIGHT TO 1 PM EDT MONDAY. * ADDITIONAL DETAILS...PLAN ON DIFFICULT TRAVEL CONDITIONS, INCLUDING DURING THE MORNING COMMUTE ON MONDAY. EXPECT REDUCED VISIBILITIES AT TIMES. HIGH TEMPERATURES IN THE 40S WILL LEAD TO RAPID MELT DURING THE AFTERNOON AND EARLY EVENING HOURS ON MONDAY. PRECAUTIONARY/PREPAREDNESS ACTIONS A WINTER WEATHER ADVISORY FOR SNOW MEANS PERIODS OF SNOW WILL CAUSE PRIMARILY TRAVEL DIFFICULTIES. EXPECT SNOW COVERED ROADS AND LIMITED VISIBILITIES, AND USE CAUTION WHILE DRIVING. THE LATEST ROAD CONDITIONS FOR THE STATE YOU ARE CALLING FROM CAN BE OBTAINED BY CALLING 5 1 1. 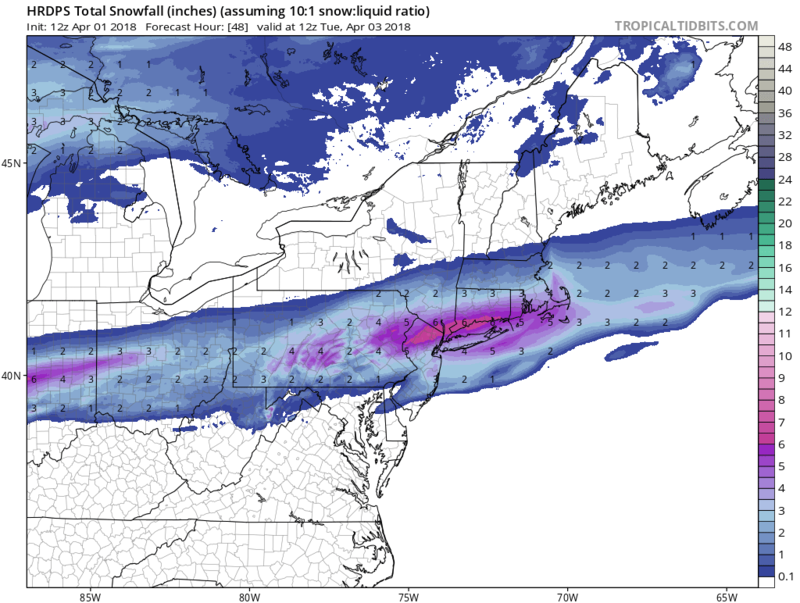 HIGHEST ACCUMULATIONS EXPECTED ON GRASSY SURFACES. 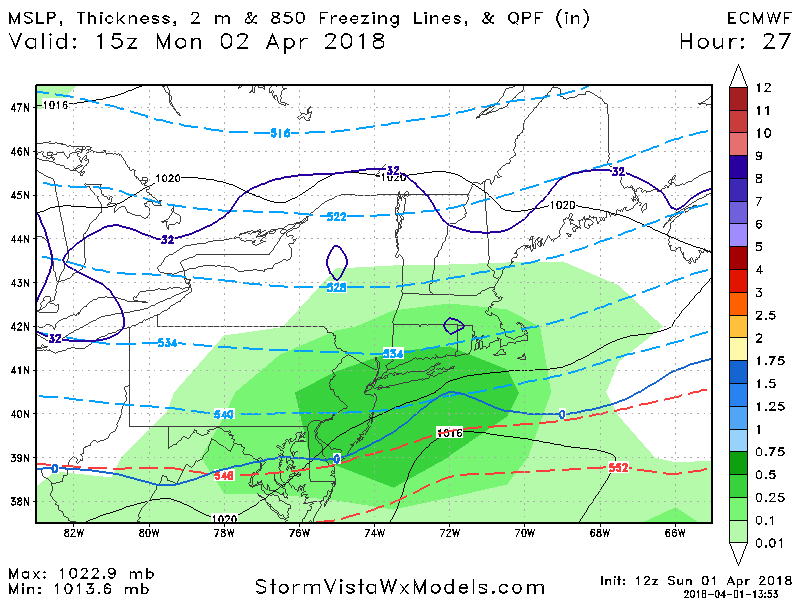 One thing I notice about the 0z and 6z GFS is it is a slightly warmer solution with the rain/snow line getting much closer to the area than yesterdays runs. 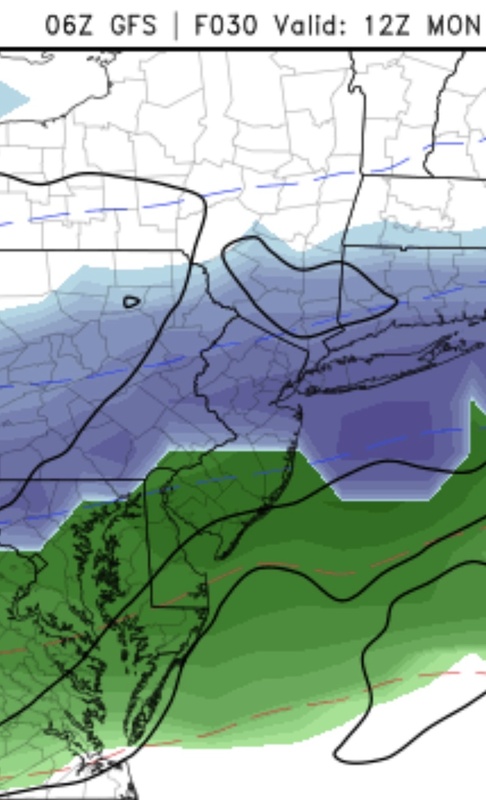 The 6z NAM is still a little bit colder but actually does show some mixing in some spots of NNJ early (maybe before the heavier precip cools things). Although this is likely also why the heavier snow totals shifted north into our area as well. Cold air wins out especially after it gets heavier, but close-call on mixing right at outset for some. Already reporting wet snow here in NE PA at my parents' house!!!! I love it!!!! Happy Easter everybody!!! 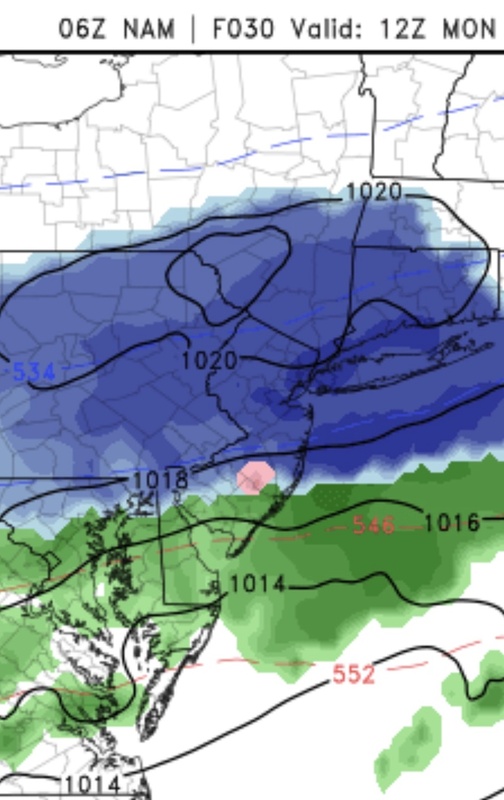 12z GFS and NAM seem to keep any mixing issues at the outset mostly to the south. GFS got a little "colder." Both have a start time between about 2 and 5 a.m. with heaviest snow during the morning rush hour. 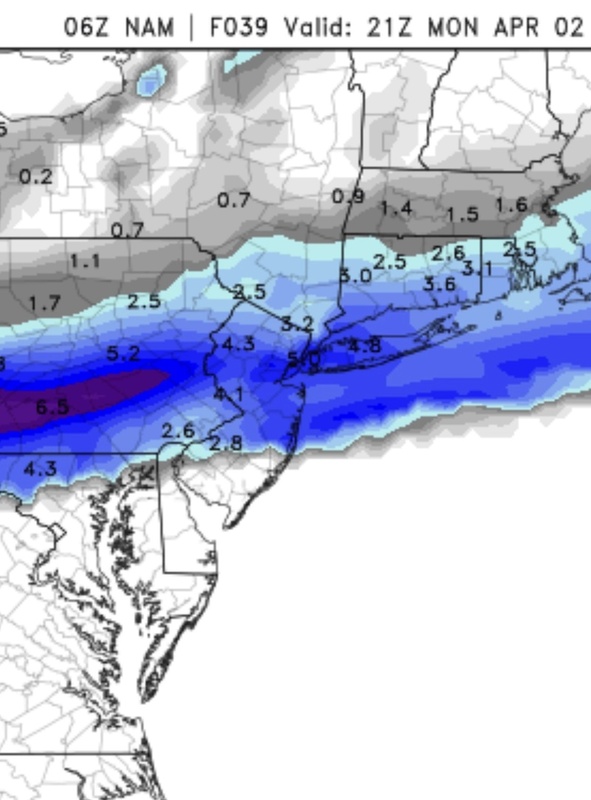 Snow totals are still consistent with earlier model runs in the general 4-6" range. 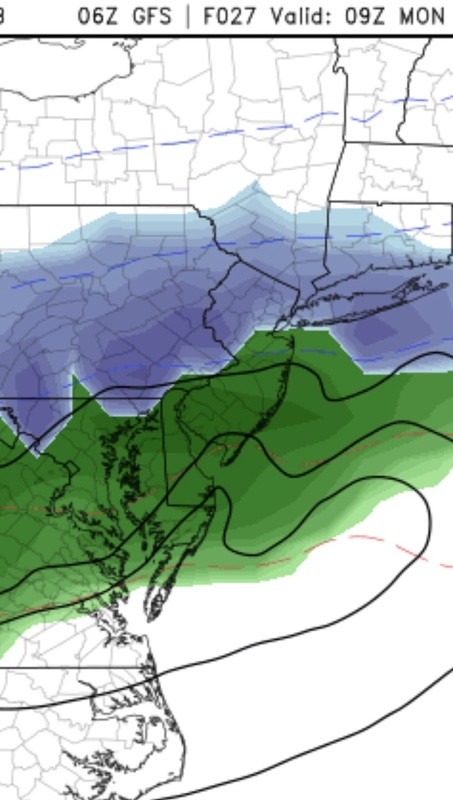 HRRR not fully in range has snow mixed with rain in some spots starting around 2 a.m., going to mainly snow for most of the area by 5 a.m. with the heaviest snow just breaking out between 4 a.m. and 5 a.m. Perfect to make the morning rush hour a mess. Pink: Mix of rain and snow, no accumulation. Dark Blue: 2-4” of Snow, but within this area localized 4-6” amounts possible. GEM LAM JUST GOES BONKERS HERE. NYC stickage and surrounding UHI will have issues IMO at this time of year to pavemen surfaces. 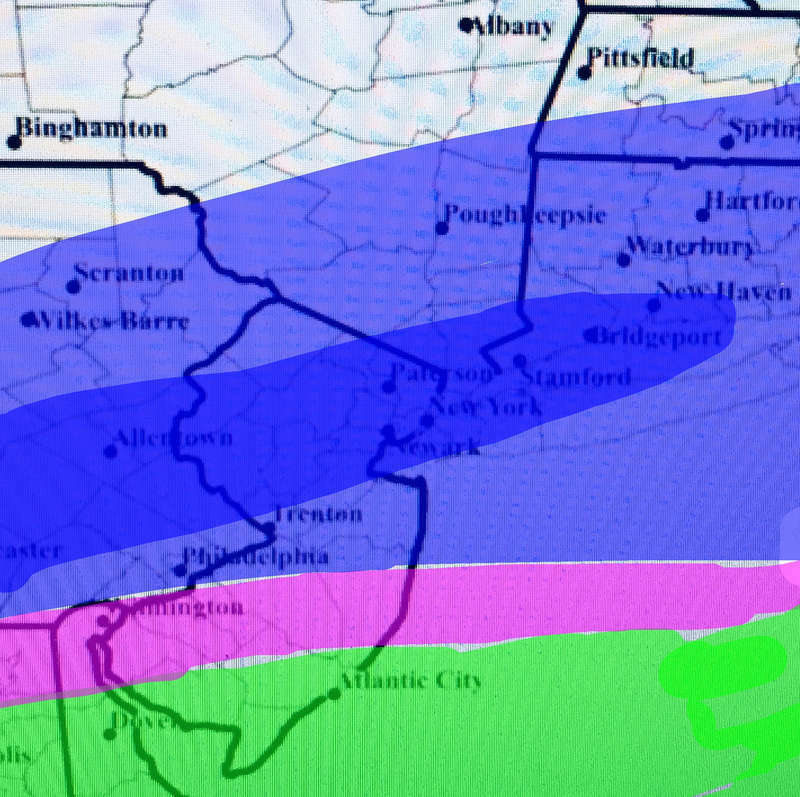 Heaviest snow starts around 5 am and goes to about 9 am. I think all snow ends west to east from about 10 am to 1 pm. Euro just reinforced this storm. amugs wrote: NYC stickage and surrounding UHI will have issues IMO at this time of year to pavemen surfaces. Agreed. 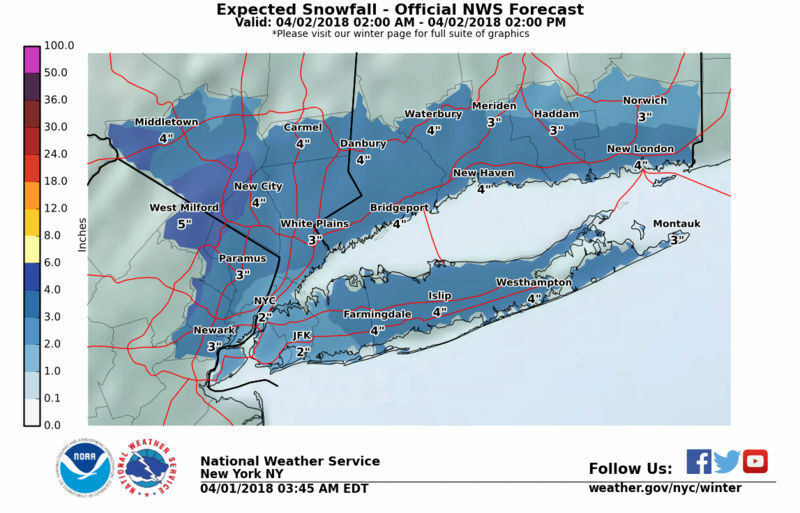 I think particularly in Manhattan and on major well-treated highways you won’t see as much accumulation on pavement, but higher elevations and side roads/less traveled streets it should stick since it’s starting a couple hours before dawn. It’s 63* out. Going to have a hard time overcoming warm ground tomorrow, for accumulations. Accumulation on pavements during nighttime with no sun angle to contend with will depend on how quickly they get to freezing, or close enough to freezing if the snow is heavy. There is some lag time for road surfaces if they’ve really been heated up. I saw one study of an October snow in Montana where temps were around 70* at 2 pm but a cold front came through. Snow started falling at midnight. Temp had dropped to 32* by 12:30 am but road surfaces didn’t freeze until about 3 am. That is when the snow started accumulating. Tonight temps may not get to freezing until dawn in some spots and may never get to freezing in other spots. So accumulation on paved surfaces will really be dependent on precipitation intensity in those spots that can’t get down to freezing.